Prior versions: Jan 2015, May 2014, Jun 2013. 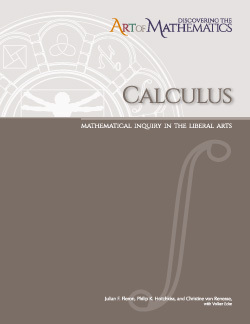 "Discovering the Art of Mathematics: Ideas of Calculus" lets you, the explorer, investigate the mathematical concepts and ideas of calculus. As you explore the notions of area and length you will encounter some famous fractals that seem to have contradictory properties of area and length. Using string art you will make beautiful art work and explore the connections between curves, tangent lines, derivatives and art. The study of integration will lead you to investigate aspects of architecture and a surprising connection to Tolstoy. Your exploration of the Banach-Tarski Paradox considers one of the most interesting paradoxes in all of mathematics.